I've been getting the gardening itch lately. 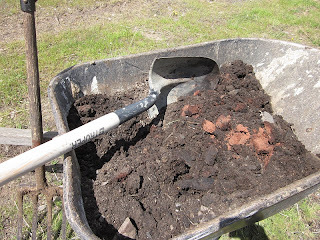 It's spring, after all, and the dirt is calling. 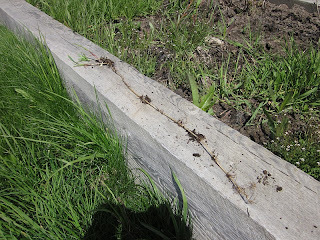 But smart north Idaho gardeners know better than to plant anything before, oh, about June 1. Sure, we all start seeds indoors... but don't put anything outside! 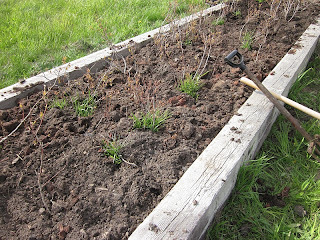 But this week we're having teasingly warm weather, and the gardening itch is hitting hard. So... 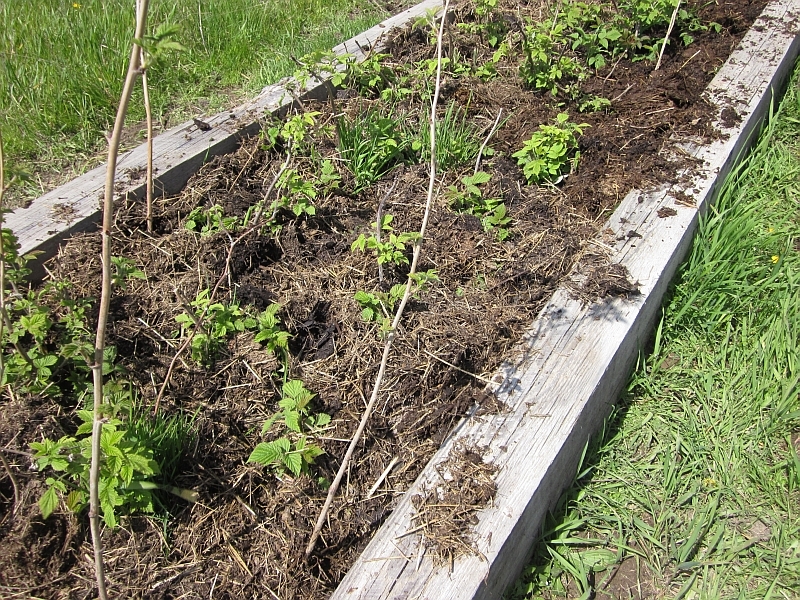 I decided to do some maintenance on the berry beds. It was a day of harsh and unrelenting wind, but I spent hours getting two of the beds set for the season. We have four raised beds for small fruits (two for strawberries and one each for blueberries and raspberries). 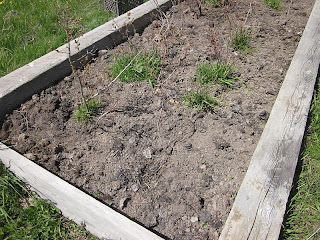 Last year I didn't harvest any fruit because I wanted to let all the plants establish themselves. I have higher hopes this year. 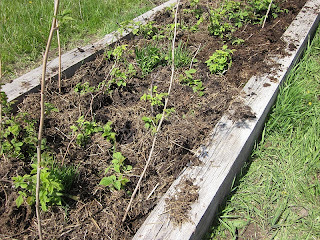 My raspberries are looking quite healthy but I wanted to mulch them with composted manure, of which (cough) we have, well, tons. Literally. 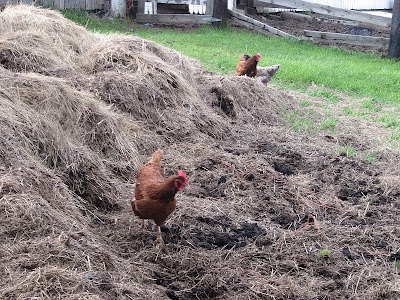 I'm afraid we don't manage our compost pile in a very scientific fashion. I just dump on top of it year after year. 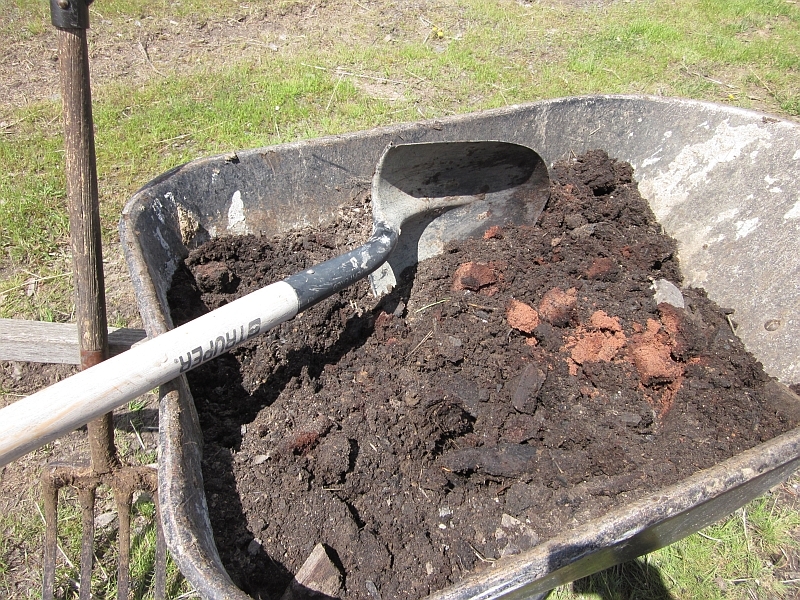 But when I want the composted stuff, I just take it from the edges. 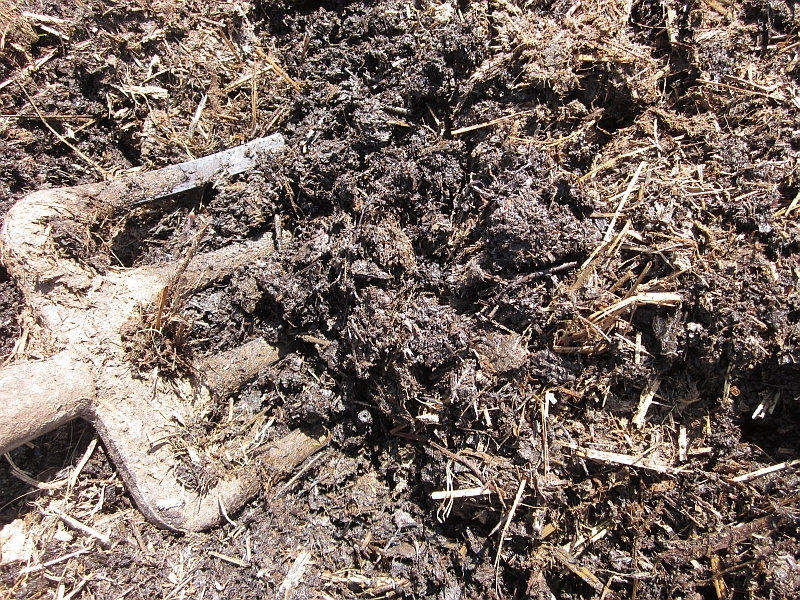 But make no mistake, the compost is beautiful -- rich and black and loamy. Perfect. The chickens came running in case I unearthed anything interesting. 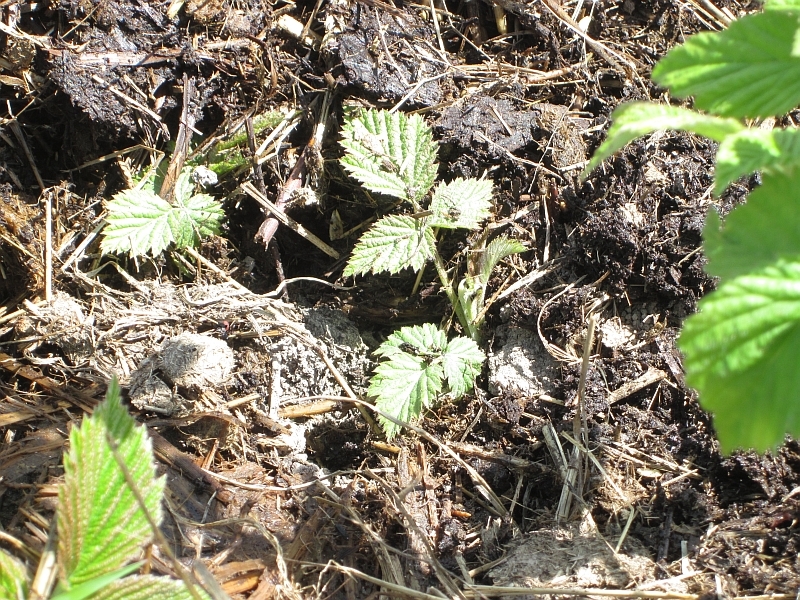 ...making sure not to bury the little guys. Now for the blueberries. Since blueberries are acid-loving plants, I wanted to lower the pH on the bed. 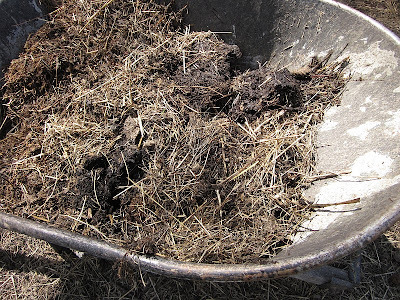 And what better source than composted sawdust? 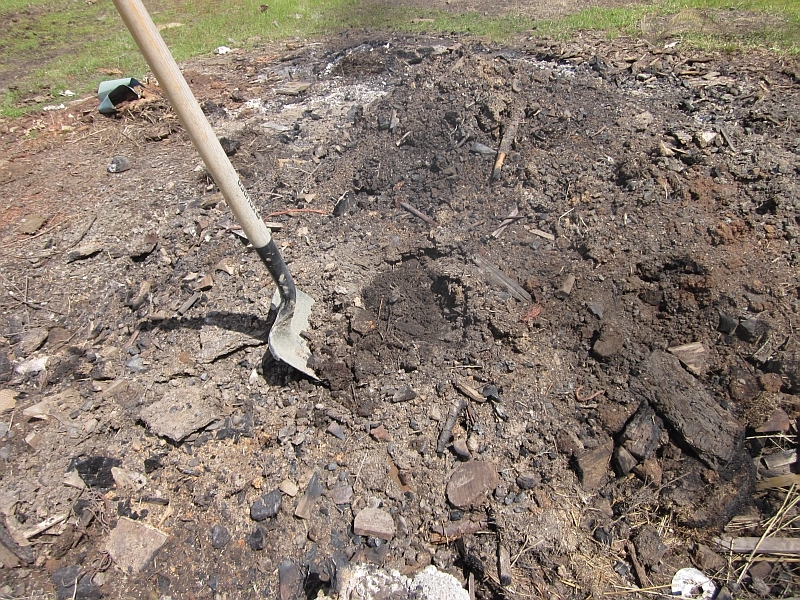 A couple weeks ago, we finally got around to burning our burn pile, a task that was long overdue. 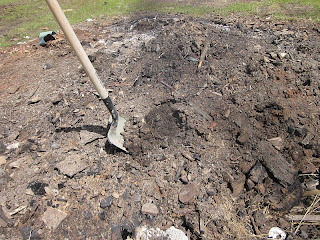 When everything had cooled, we realized that the large lump in the center which didn't burn was old rotten sawdust (we'd dumped it on the burn pile a couple years ago and then forgot all about it). So... 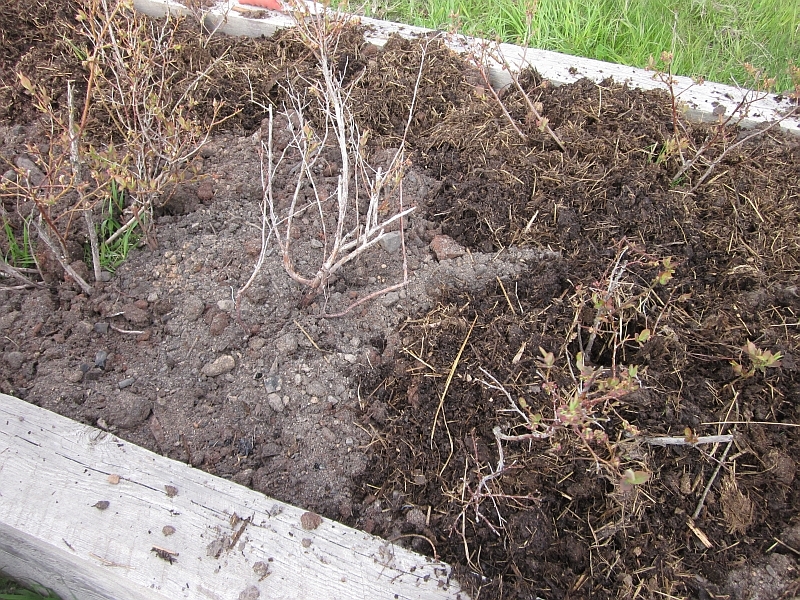 I shoveled it up and started spreading it on the blueberry bed. Composted sawdust is an excellent garden amendment, particularly for acid-loving plants. I always think it's terrific when waste products can be put to good use. Talk about the ultimate in recycling! 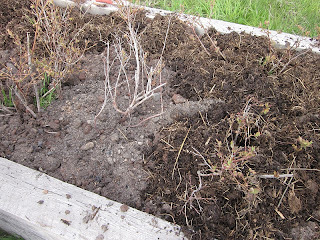 I had to finish weeding the blueberries before I could spread the sawdust. Take a gander at the root system on this grass. 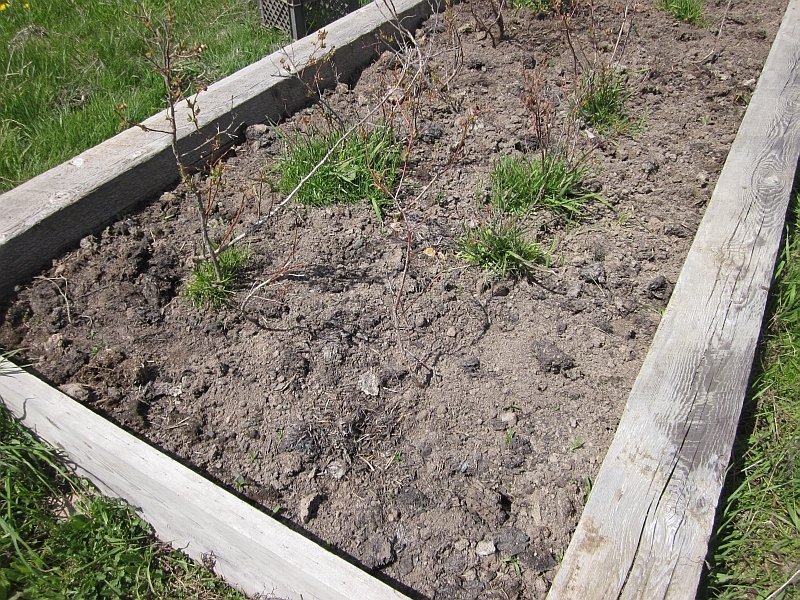 Here's the bed after the sawdust is on. 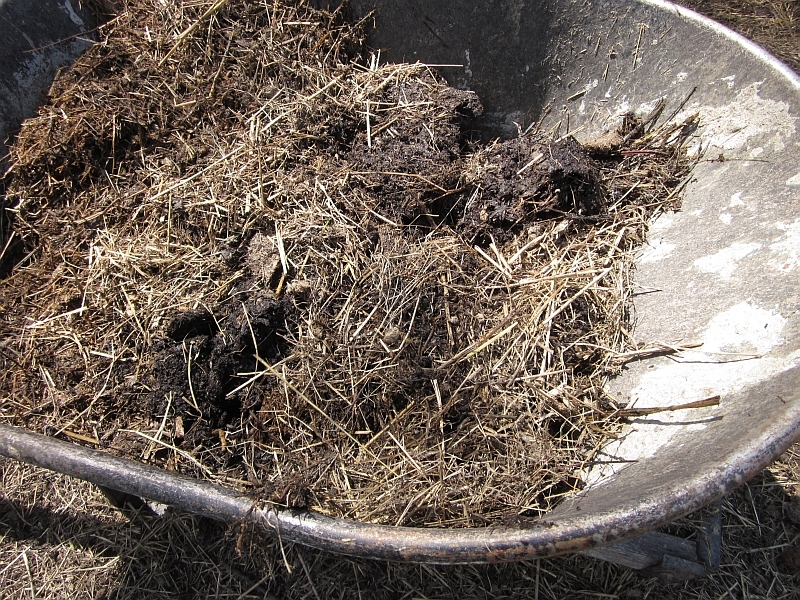 Then I added composted manure on top of the composted sawdust. Quite the treat for the blueberries! After so many years of neglect, hopefully this year they'll thrive. 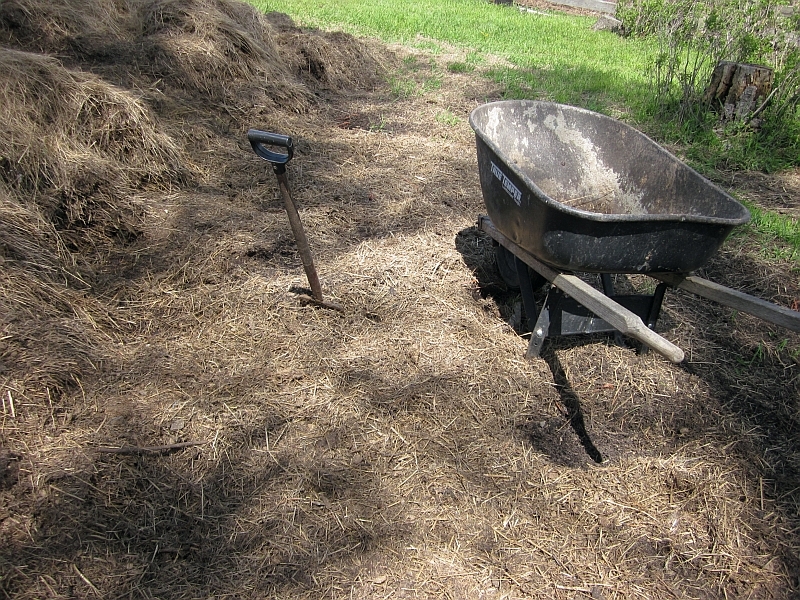 Manure pile "management" isn't difficult if your tractor has a front loader. 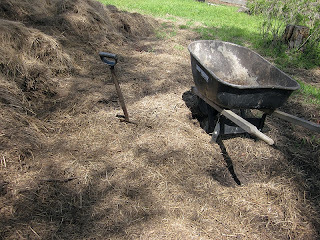 I "stir" the pile every 4-6 weeks by merely moving it from area "A" to area "B" and then moving from "B" to "A" 4-6 weeks later. 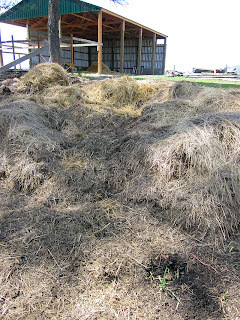 That helps dry out wet/"hot" manure and buries any weed growth as well. Your mileage may vary, but it works well for us. 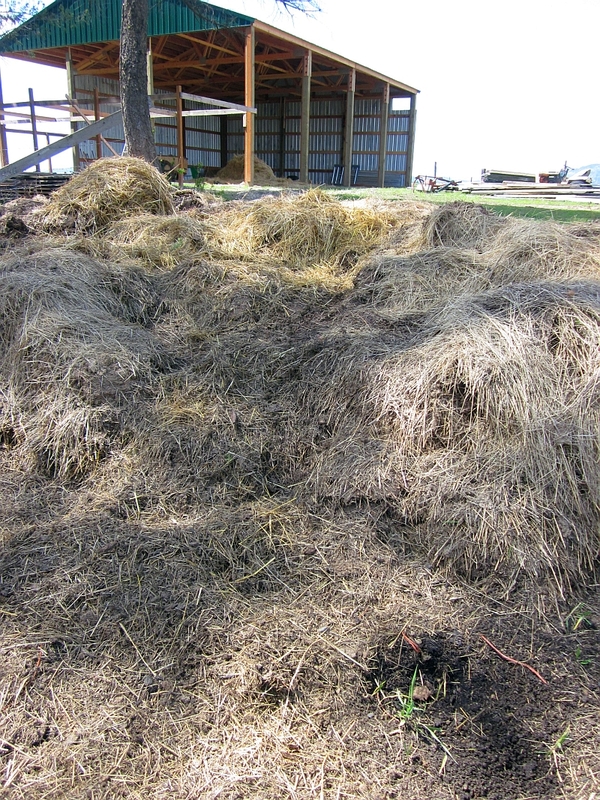 Manure pile management wouldn't be difficult if we had a tractor, period. Ours has been on the blink for about two years now. Once in awhile we borrow a friend's, but we tend to focus on other things the times we have his tractor available. Always like hearing about your gardening adventures. Just as a note to all the beginners out there....I've been gardening most of my life and it's taken me three years of experimentation just to get it right with strawberries. I'm finally ready to put in a real bed. 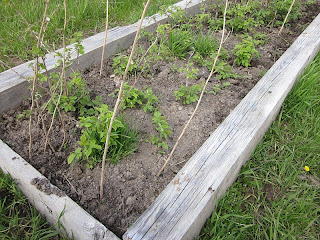 It took me three years to not just figure out how to grow them and overwinter them, but how to keep the birds and rabbits from getting them before I did. This year, I'm using Patrice's method - bird netting. I didn't think it would keep rabbits out, but the netting in combination with my perimeter fence seems to be doing the trick. I can't wait to make my first batch of jam!